Fine engraving and an unusual projection. Tabula Geographica quae Continet Totam Fere Europam et Proxima Africae In usum Historiae Recentioris. 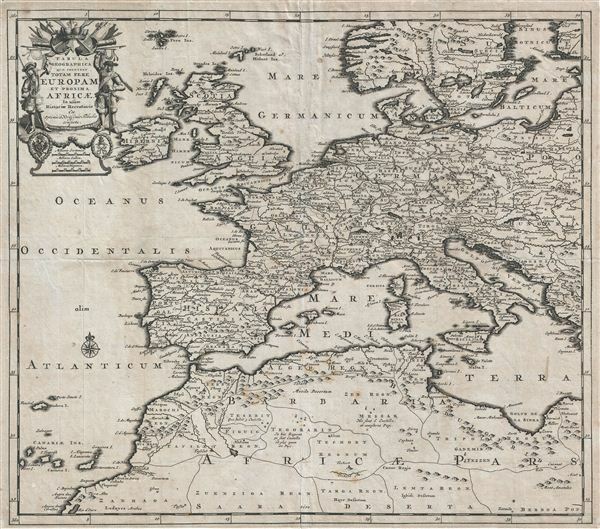 An appealing 1710 map of europe and northern Africa by the Dutch map publisher Pieter Van der Aa. The map covers all of continental europe as well as the British Isles and parts of adjacent Scandinavia and Northern Africa, specifically the Maghreb or Barbary Coast. This map is peculiar for its unusual projection, unique to the rare original work of Van der Aa, in which horizontal distance is greatly exaggerated. An elaborate martially themed cartouche appears in the upper left quadrant. Some editions of this map were joined by the publisher to a partner map of western Asia. The present example is a stand-alone edition. Very good. Slight wear on original fold lines. Lower margin extended. Even overall toning.